Punctures are a type of skin wound made by a narrow sharp object. Puncture wounds can become infected, so need proper care. 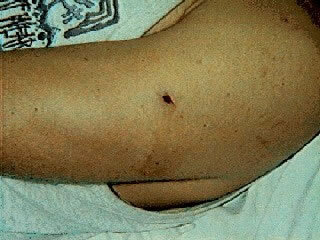 A tetanus shot is often needed after a puncture wound. Needlestick: if the wound is from a used or discarded needle, call a doctor right away. In some cases, medicines need to be started to stop the spread of HIV/AIDS. Foot Punctures: punctures into the bottom of the foot have a 4% risk of infection. This risk is higher in people with puncture wounds that go through a shoe. Pain lasting 4-5 days after the injury may be a sign of infection. Pencil Lead Punctures: pencil lead is made of graphite, which is harmless. Pencils are not made of poisonous lead. Colored lead pencils are also nontoxic. However, the graphite will cause a tattoo if it is not scrubbed out. You can treat minor puncture wounds at home. 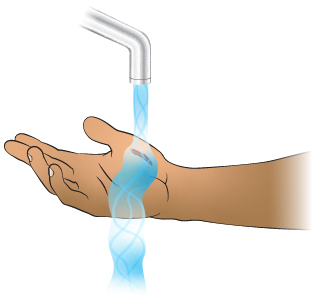 Cleansing: Wash the wound with soap and warm water for 15 minutes. Scrub the wound with a washcloth to remove any dirt. Gently trim off any flaps of loose skin that cover the wound. These can keep the wound from draining. Clean the scissors with rubbing alcohol before and after use. Antibiotic Ointment: Put on an antibiotic ointment covered with an adhesive bandage (Band-Aid) to reduce the risk of infection. Re-soak the area and put on more antibiotic ointment every 12 hours for 2 days. Expected Course: Puncture wounds seal over in 1-2 hours. Pain should get better within 2 days. 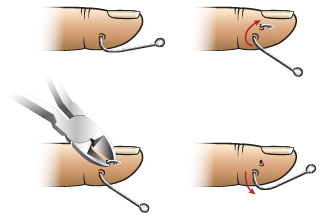 This is method of fishhook removal is sometimes referred to as the Advance and Cut Method. Step 1. Using pliers (or needle drivers) firmly grasp the hook. Step 2. Push (advance) the hook until the tip of the hook pops out through the skin. Step 3. Cut off the tip of the hook (and the barb). Step 4. Pull (back out) the hook out. These instructions assume that you can not get into see a doctor right away. In most circumstances it is best to have a physician (or other licensed health care provider) remove an embedded fishhook. The hook in this drawing has only a single barb at the tip, and thus the tip of the hook (with the barb) can be cut off and the hook pulled backwards through the skin. Some hooks can have more than one barb along the shaft of the hook. In such cases, it is better to cut off the ring at the bottom of the hook and push the hook all of the way through the skin.